Introducing children to nature that surrounds them is a great thing and Victoria has plenty of places to go. Of course, packing those little ones to all of your favourite hiking spots requires a little more planning, a little more to load in your backpack but a whole lot of fun to be had. Keep kids close when out in the forests as there are many cougars on Vancouver Island. If you do encounter a cougar, make yourself appear big and slowly back away. Never run as that can trigger a predatory response from the cougar, which may chase you. Bring plenty of water and food / snacks. Kids need to keep their energy high and will need to eat more often than adults. Expect to walk at a leisurely pace and to take extra breaks. Always tell someone where you are going and when you expect to be back, this way if something goes wrong, they can call for help. There are some areas, such as East Sooke Park, that do not have cell reception, so do not rely on your phone. Here are some of the top choices for kid-friendly Victoria hiking and things to think about before you head out. What do kids like more than to run through the sand at the beach and Witty’s Lagoon has a long stretch of spectacular, soft sand for them to get sink their little toes into. The lagoon can be an all day affair with your little ones or a shorter family trek. As the trail takes a bit before reaching the lagoon, be prepared to carry any toddlers. Pack some lunch, snacks and any beach toys as they will probably work up an appetite after some hiking and beach fun. The beach during low tide at Witty’s Lagoon. At the beginning of the hike, there is a Nature Centre where you can see a variety of photos and learn a bit about the area and the plants and animals that inhabit Witty’s Lagoon. A little further along, you will be able to see Sitting Lady Falls, a delightful waterfall viewed best from a platform a little further down the trail. Bring hats, sunscreen, towels and a change of clothes for your day out on the beach. Approximately an hour from downtown Victoria, in East Sooke Park is an adventure waiting. Iron Mine Bay is an easy trail through scenic, lush rainforest. The route ends at a rocky beach area where kids can explore and play near the water. Pack sunscreen and a hat for those sunny days. A view of the rocky beach at Iron Mine Bay from the top of the nearby outcrop. The wilderness is a fantastic place for kids to learn and in amongst the large trees are birds and animals to hear and see. We suggest to keep children close by as there are some rock-faces over the water and this area has had history of cougar sightings. Pack a lunch for a break in the day and enjoy the sights of the Juan de Fuca Strait from the Coast Trail before heading back. The perfect destination in the Victoria area for a day-trip with the family is Coles Bay Regional Park. The trail to the beach is an easy 30 minutes round trip with a picnic area and lots of beach area for kids to play and explore. Located just 35 minutes from downtown Victoria, the bay is a popular spot with two different trails to get to and from the beach. There is the Beach Trail and the Nature Trail so you can take one to the beach and the other on the way home for different scenery. The Beach Trail takes you through a forest filled with majestic western red cedar trees. The Nature Trail is a grassy trek with a spot to overlook the beach area. Hiking along the trail to Coles Bay. As with other beach trips, make sure you pack all the sun safety items such as hats and sunscreen as well as swim suits, beach toys and a change of clothes for the way home. 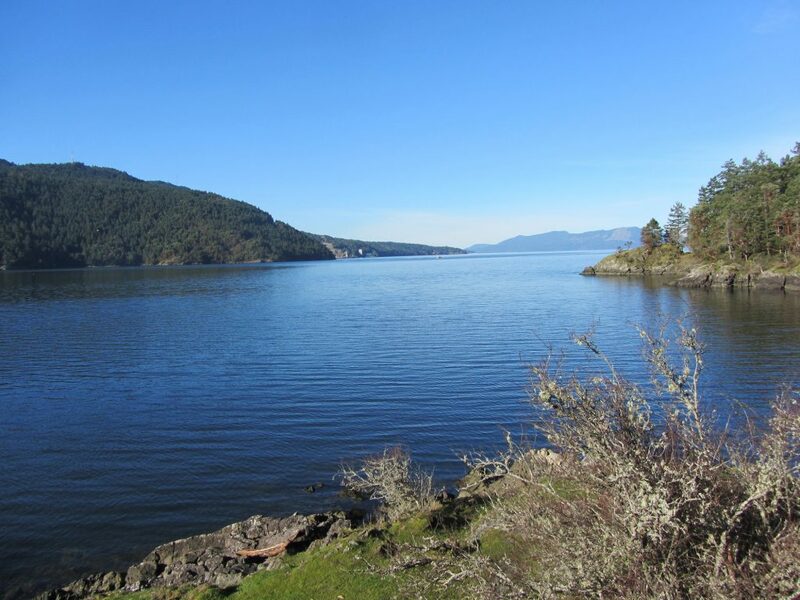 Enjoy the picturesque views of the Saanich Inlet from the bay on your relaxing day by the water. For a slightly more challenging kid-friendly hike, there is McKenzie Bight in Gowlland Tod Provincial Park. This hike is approximately 3.5 kms round trip running along the eastern shore of the Saanich Inlet that has a steep hill from the parking lot down to the inlet. So, it might be nice to have a backpack carrier for toddlers that get tired along the way. Make sure you pack water and some snacks even if you don’t intend to stop for lunch. The gorgeous forested trail can be made into a loop along the Cascade Trail and returning along the McKenzie Bight Trail. Along the Cascade Trail, you cross a wooden bridge and shortly after can see Cascade Falls, one of the more scenic waterfalls in the area. Keep children close to safely admire the rushing waters. The view of Saanich Inlet from McKenzie Bight. Once the trail opens up to the beach area, the kids can play and explore the new terrain. Pack sunscreen and a hat for those sunnier days. This would be the perfect time to have a bite to eat before you begin the hike back. For a change in scenery for the family, there is Tod Inlet located in Gowlland Tod Provincial Park. This one hour round-trip hike begins meandering through green forest running alongside Tod Creek. The trail will open up to a clearing surrounded in history from the days when the Vancouver Portland Cement Company used the inlet. There are still remnants of the Industry including what is left of old buildings, train tracks and more. It is always suggested to be extra careful with kids in these types of exciting surroundings. The gravel trail will connect with an old cement road taking you along to Tod Inlet. Exploring an old boat launch at Tod Inlet in Gowlland Tod Provincial Park. The inlet has a dock out to the water and small beach areas along the water for the kids to enjoy. Another area to explore is the mouth of Tod Creek. Walk back along the water in the direction of where you came and, when the trail veers left, look for a trail to the right that crosses two small, wooden bridges. Follow this trail as it pass through the forest, down some wooden steps to the creek area. There is choice in trails to go back by. You can return on the main trail or for a bit more of a challenge, there is another hike along Tod Creek. If you have young ones, they may need to be carried. Only 25 minutes from downtown Victoria, Tod Inlet is a must see.